The England squad for next Wednesday’s friendly against Sweden in Stockholm, with a few noteworthy call-ups to take heed of; namely for Jack Wilshere, Raheem Sterling and Everton’s in-form midfielder livewire Leon Osman, who gets his first tip for the national side aged 31. First things first, that’s one hell of a reedy looking frontline. Hardly the kind of firepower reserves to fill you with confidence. 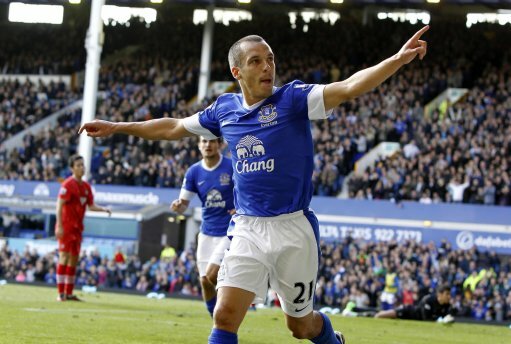 Secondly, Pies are really glad to see Leon Osman get the nod. He’s been fantastic for Everton in their last clutch of games; energetic, hard-working, disciplined, crafty in and around the box and he’s even mucked in with a couple of goals here and there. Well played Sir. Let’s hope he gets more than a few cursory minutes. There definitely seems to be more of the meritocracy about the England squad since Roy Hodgson took over, with the dynamic-if-flighty Sterling also well deserving of a call-up given his current form. Likewise with Forster and Shawcross. We are, however, a little concerned about Jack Wilshere’s sudden return to full action for both club and now country. He was out for over a year and within weeks of beginning training he’s starting for Arsenal against Man Utd. Without wishing to sound like pessimistic doom-mongers, it all seems a little needlessly premature to us.